The truth is that He WILL put more on us than we can bear. It’s how He grows our faith and trust in Him. If He didn’t strategically and purposefully allow adversity in our lives, we wouldn’t come to know His power for ourselves and then trust Him more and more. And if He didn’t allow situations where we were forced to trust Him, how could we ever come to a place where we could have faith for the “exceedingly abundantly” He’s already promised us? I mean, how could you trust God for that bill being paid, that job, that car, that house, or that healing if you hadn’t already learned through experiencing Him yourself in your challenges that He’s able? If He didn’t put more on us than we could bear, we wouldn’t need Him and we certainly wouldn’t need Jesus. Heck, we’d be our own saviors every time. This is why the Bible says we should rejoice in our weaknesses because it gives God a chance to show Himself strong, to show up and show off on our behalf. With the things I’m fighting, the things I’ve been through, the things you’re up against and been through, you would have lost your natural mind, maybe even taken your own life BUT for God. I absolutely believe that God puts more on me than I can bear — not overcome, but bear — because otherwise how will He prepare me for what’s to come? What testimony would I have if I never had to cry out to Him in my dark places? And what kind of faith would I have if I didn’t have to believe — while I sat in those dark places, even as tears streamed — that He’d purposed that moment to bless me only AFTER He guaranteed that the weapon wouldn’t prosper and that I would win, it would all work to my good? I don’t know who else I’m talking to right now, but know this: you ain’t always gotta be strong. He wants you to let Him be your strength. To grow you, to grow your faith, and to increase your expectation in Him. God’s got more for you on the other side of this — no matter what your “this” is. I love you. More importantly, God loves you! Last night marked the fifth and final installment in my five-week, Leap of Faith Prayer Call for women. It has been an absolute honor and privilege to be able to pray for and with women as they believe God for more in their lives. I can only hope that this prayer line was a blessing and/or encouragement to those who dialed in or listened to the recordings. I know I definitely saw God move in my life in this time with you all. If you want your faith to grow so you can claim God’s promise in Mark 9:23 — “Everything is possible for the person who has faith” (GNT) — then you must first understand that God takes you through six phases of faith. Phase 1: Dream What is the dream God has given you? If you don’t have a dream you’re working toward, you just exist. You need to start praying, “God, give me your dream.” You’re here on Earth for a purpose. When you discover that purpose, you’ll discover the dream God wants you to go after. 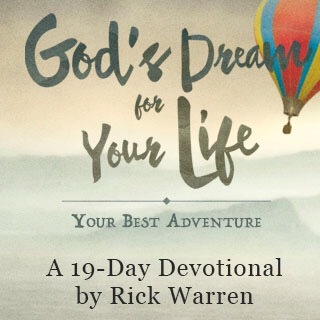 “God … is able to do far more than we would ever dare to ask or even dream of — infinitely beyond our highest prayers, desires, thoughts, or hopes” (Ephesians 3:20b TLB). Phase 2: Decision Maybe you have a dream from God, but you’ve not yet made a decision to go after it. God’s word for you in phase 2 is, “Go for it!” You may need to make the decision to give your life to Christ or be baptized or join a church or get involved in ministry. “If you are like that, unable to make up your mind and undecided in all you do, you must not think that you will receive anything from the Lord” (James 1:7-8 GNT). Phase 3: Delay When things don’t happen on our timetable, we tend to run ahead of God and create detours to make it happen. Do not detour! You may end up making the wrong decision. You’re in God’s waiting room. Wait for God to work his hand. God says in Habakkuk 2:3, “But these things I plan won’t happen right away. Slowly, steadily, surely, the time approaches when the vision will be fulfilled” (TLB). Phase 4: Difficulty What difficulties have you faced waiting for your dream to be fulfilled? You’ll go through many tests in life, but God knows what you’re going through. He’s watching, and he hasn’t forgotten you. “Even though you are temporarily harassed by all kinds of trials and temptations. This is no accident — it happens to prove your faith, which is infinitely more valuable than gold” (1 Peter 1:6-7 Phillips). “At that time we were completely overwhelmed, the burden was more than we could bear, in fact we told ourselves that this was the end. Yet we now believe that we had this experience of coming to the end of our tether that we might learn to trust, not in ourselves, but in God who can raise the dead” (2 Corinthians 1:8-9). Phase 6: Deliverance Do you expect and trust God to deliver you? He will. But it doesn’t happen overnight. You have to go through all six stages before God brings you to deliverance. For the past few months, the Lord has really been working with me on one simple, yet significant, principle in my walk: trust My promise, don’t worry about My plan. You see, my husband and I have been believing God for some very specific things and I found a few weeks back that what had began, for me, as bold, expectant faith, had somehow morphed into anxious, obsessive lusting after this thing. So much so that I began trying to orchestrate for God how He could deliver said thing. Needless to say, my plans never came to fruition. But even as I continue to learn this lesson – the importance of guarding your focus when you’re waiting in faith – the Lord encouraged me to share it with you all, too. And you can always check out my other posts here. You’re a bit of a dictator. And I am, too. The Holy Spirit gave me the revelation one day as I lamented why the blessing the Lord said He’d give me wasn’t coming the way I thought it would, or should. Imagine that: I was trying to tell the Gift Giver how to give the gift. It happens much more easily than you might think. The Holy Spirit confirms to you that indeed the Lord heard your prayers for a new house, a new car, a way out of debt, peace about that child, or whatever. Excited, you begin looking at your circumstances trying to figure out how He’s going to do it. And that’s when the enemy slides into the conversation. Well, Lord, I know you said I’m the lender and not the borrower, but I don’t make enough to pay off all of these credit cards. My God, you know I need a new car, but with a credit score like this, it’s never going to happen. I’ve been praying for a new job for weeks, Jesus, but they gave that job to someone else even though I interviewed. What gives? Just that quickly, your focus has shifted. Instead of keeping your eyes on the One who is your Source and Provider, you’re looking at what He wants to give. Instead of fixing your gaze on and pursuing the face of God, you’re inexplicably fixated on His hand. Unavoidably, when what you see in your human life doesn’t look like what God has promised you in the Spirit, you then get downright depressed and indignant. You question God, you wonder if it was really His voice, and you quickly lose the sense of peaceful and patient expectation you once had. God’s word is clear: we are to trust God. When we presume to know how God will bless us or deliver our breakthrough, we go from asking of God to demanding of Him. We move to telling Him how to be God, instead of through faith trusting Him to be God. And there are many risks associated with taking our eyes off of God. First, we run the risk of making a little-g god of the very thing God intended to be a blessing. Second, for the God who is able to do exceedingly, abundantly more than we think and imagine, we also run the risk of limiting His move in our lives when we confine Him to blessing us in the way that makes sense to our human logic. And, third, trying to force God to work within the boundaries of our plan can ultimately cause a delay in us receiving the very thing we so badly want. It’s a no-win situation. I mean, why would we even allow ourselves to go down this path of trying to play God’s hand for Him? We know from Isaiah 55:8 that His ways are not our ways, yet we somehow still try to plan exactly how and when He will move in our lives. Well, as a recovering faith dictator, I share this word of hope: there is a way back. When you find that you’re obsessing about this thing, always trying to guess how and when God will deliver it, actively choose right then and there to offer praise to God for simply being God. As your praises go up, your focus will be returned to the Gift Giver and away from the gift; and most likely your peace about that thing will also be restored. That space – inexplicable peace in the face of seemingly insurmountable odds – is where God wants us to stay, to live. He sent His Son to die for us so that we might have eternal life and unlimited access to the peace and joy that comes with not having to worry about anything. 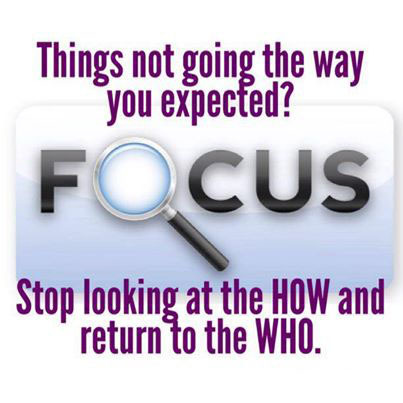 Do you need to check your focus? Are you now consumed with the how of God’s blessing, instead of with God Himself? If this is you, cut yourself some slack and decide to put your eyes back on God. And if you aren’t sure if this is you, here’s a quick test: does the idea of how God is going to do that thing for you cause you anxiety? Do you feel like you’re obsessed with getting that thing, and you find it frustrating that the way you thought it would happen didn’t come to pass? If you’ve answered yes to any of these questions, welcome to FDA (Faith Dictators Anonymous). We’ve saved a chair for you. The question took me aback. Here I was sacrificing hours of precious sleep before the kids awakened to “seek ye first the Kingdom,” and this was how my prayers were met? Casting the whole of your care [all your anxieties, all your worries, all your concerns, [once and for all] on Him, for He cares for you affectionately and cares about you watchfully. Casting – participle denoting an act once for all; throwing the whole life with its care on him. All your care – the whole of your care; “Not every anxiety as it arises, for none will arise if this transference [sic] has been effectually made.” Care. See on Matthew 6:25, take no thought. The sad truth about Christians being “sick and tired” of things is that “sick and tired” is a consequence, a symptom if you will, of not casting all of your cares. If you’re like me, a wife and mom trying to balance family life with a career and carving out some semblance of your own identity on the side, it’s easy to cast your cares as they arise – as the bank account is overdrawn, as the milk runs out, as the bills stack up, as the car needs repair, or whatever – and then, unknowingly take them back; swapping them for whatever the new crisis du jour is in your life. This, ladies and gentlemen, is not casting all of your cares; this is placing them temporarily and then snatching them back. This is tasting God’s peace instead of owning and walking in it. This, my friends, is the definition of insanity. And we all do it. It can be easy to forget our need to minister to ourselves when we’re so focused on being everything for everyone else. It’s a lot of work and someone has to do it. But what the Lord reminded me of was that our faith cannot take a backseat to our lives. In fact, our faith must be the driver. When we can’t get a moment of peace between tantrums, ear infections and sibling spats, we must cast our cares because the word says that God’s grace is sufficient for today. When we can’t catch a break between the misplaced debit card, lack of luster in the marital bed, and the surprise ER visits to dislodge marbles from, well, places, we must cast our cares because the word says that no weapon formed against us shall prosper. When we can’t go another day in that job, in that house, or even in that relationship, we must cast our cares because the word says that the joy of the Lord is our strength. And when we just can’t see a way through the dark despair and desperation we sometimes find ourselves in when we have to be so much to so many other people, we must cast our cares because the word says that God has a plan to give us hope and a future. If we don’t speak life and truth back to him the moment he begins his mind games, we allow him to heap back onto our already-too-full plates the worries, concerns and cares we previously gave to God. It can be incredibly difficult to find a few minutes of silence when you’re juggling a million other things, let alone string enough minutes together to read and pray, but I urge you all to find the time. Not only do your peace, joy and even sanity rely upon you doing so, but your family’s welfare does, too. After all, a sick, tired and worn out momma (or daddy) is no good to anyone. Are you tired of being sick and tired? Are you ready to have an extended season of peace and joy? Are you ready to focus more on your testimony than your tests? Take care of your Spirit. Take care of you, and then, as the Bible says, all these (other) things will be added to you.